We're taking THE MOON WITHIN on the road! I will be visiting six territories in the US to meet with librarians, booksellers and the press in a whirlwind tour. Look for my updates on Twitter, FB and Instagram. Help officially launch THE MOON WITHIN into the world! 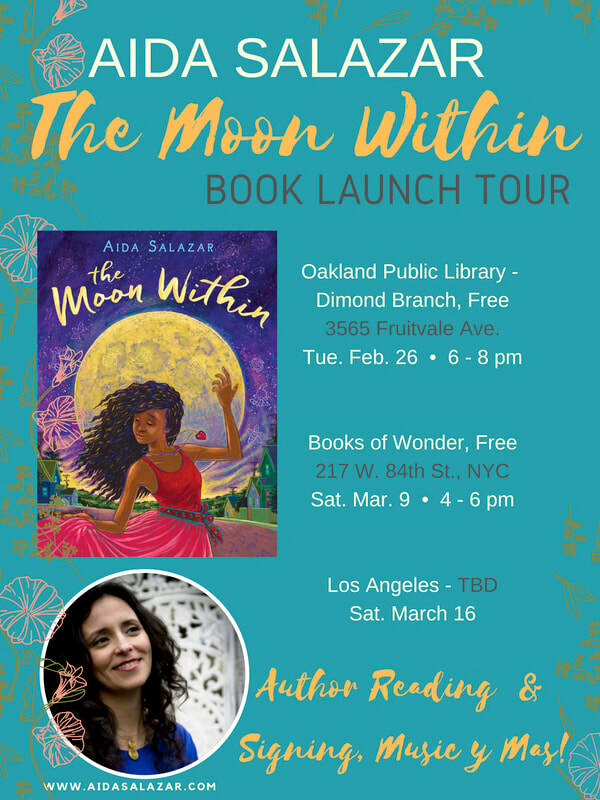 Join us for a reading by Oakland author and Oakland Public Library patron, Aida Salazar. Plus, enjoy a special live bomba dance and drum performance by local youth artists. Books will be available for purchase by local bookseller, Booklandia. Saturday, March 9 at 4 pm. The second launch event for THE MOON WITHIN! Join us for a reading and signing at this wonderful bookstore. This event will take place right after Bank Street College Latinx Mini Conference (see info below). The Los Angeles launch is TBD. Stay tuned for exact details! I'll be part of Bank Street College Center for Children's Literature conference on Latinx literature. My panel on Middle Grade books will include authors Emma Otheguy, Pablo Cartaya, Hilda Burgos and will be moderated by Dr. Carla España. I'll be hanging out at AWP this year and looking forward to continuing to learn from my colleagues. I am currently looking to book a reading for Las Musas while there. Please contact me if you can help. I will be on two panels at the only conference in the country that centers kidlit authors of color! I've been wanting to go since it began and finally, I'll be able to attend! ​I'll be on a panel called, Life Can Be Difficult: Tough Topics in Middle Grade. More info soon. I'll be leading two workshops: How to Write a Novel in Verse and Taboo Topics in Middle Grade. For school or library visits or other requests please contact me below. Thank you!